There's minimal website help and credit card-only payments, but get past that and Freedom-IP offers decent speeds and some useful low-level settings. 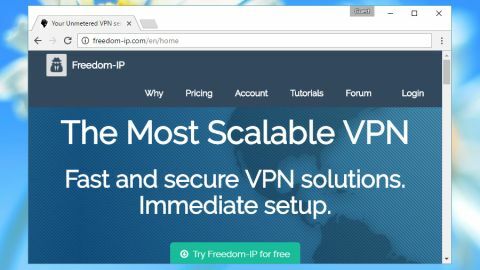 A VPN provider's website tells you a lot about the service, and it didn't take us long to spot some fundamental problems with Freedom-IP. Clicking Tutorials led us to a page saying only ‘Help & FAQ – Under construction...’, for instance. No help? Really? There is a Forum link, but it seems more about news than anything else, and the posts are mostly in French. There's a ticket-based support system, but we'd expect basic advice to be available on the site. Fortunately the core service looks reasonable: unlimited traffic, 40+ locations (Europe, USA, Canada, Russia), PPTP, L2TP/IPsec and OpenVPN compatibility for use almost anywhere, a firewall, port forwarding and more. There's also a ‘special gamer mode’ to give you "the best possible latency network (lower ping)", apparently, although Freedom-IP offers no details on what this is or how it works. The major selling point is probably the price, at €5 (£4.30, $5.40, AU$7) for a single month, €3 equivalent (£2.60, $3.25, AU$4.20) if you sign up for a year. You even get a 3-day free trial to check it out, which seems like a good deal to us. The good: as with other services, Freedom-IP states that it "does not record the content of communications". The more questionable: the company does not perform deep packet inspection on your traffic "unless necessary for the operation of a user functionality." What ‘user functionality’ could possibly require in-depth analysis of your traffic? We would like to know more. Browsing the terms of service revealed another interesting clause: "any customer who makes unreasonable demands on the service may be restricted." Use the service ‘too much’ and it sounds like your connection might be throttled. We clicked the Try button on Freedom-IP's website, entered our email address and were redirected to the payment site. This only allowed payments by MasterCard, Visa or a HiPay wallet, unfortunately, which is a bit of a concern. Set up a subscription by PayPal and you know, as an absolute guarantee, that you can cancel it within seconds, whenever you like. Do this with a credit card and you just have to hope that the VPN provider will handle a cancellation properly. We're not judging whether Freedom-IP will do this or not, it's just an extra potential point of failure which might come back to haunt you, later. We signed up anyway and logged on to the Freedom-IP console, where there was a remarkable lack of help for getting started. No step-by-step tutorials, not even a clear ‘go here’ indicator; instead you're left to figure it out for yourself. We followed the Downloads link. A Windows link seemed to offer a copy of OpenVPN, so we grabbed that, but couldn't find the config files usually available on other services. It turned out that the OpenVPN build we'd downloaded had been customised to include them already, which is actually a good idea, just as long as you make this clear to customers in the first place. Once setup was complete we were left with an OpenVPN icon in our system tray. Right clicking this displayed the list of locations, and we were able to connect in a couple of clicks. You'll have to enter your username and password each time, though, unless you know enough about OpenVPN to figure out the alternative. For all the hassles and concerns, Freedom-IP's performance was better than most in our tests*. UK-UK connections gave us 30Mbps downloads at a minimum, nearby countries were the same or better, and switching to the US still delivered 20-25Mbps with no particular latency or other issues. The service also has a lot of advanced features available on the web console. There's a ‘low latency’ mode; LZO compression enabling/disabling; custom DNS and DNS leak settings; network buffer configuration; port forwarding; finely-grained web filtering, and more. The good news continued with our final privacy tests, where the service shielded our IP and kept us safe from DNS and WebRTC leaks. Beginners will hate Freedom-IP's lack of website support, and we're not happy with the session logging and credit card-only payments, either. But if you're an advanced user, Freedom-IP offers you reasonable speeds and high configurability for a very low price.